Coconut oil is a popular Paleo cupboard staple, and for good reason: it’s incredibly versatile. Coconut oil is stable at high-heat and not prone to oxidation, like other fats that have a high percentage of polyunsaturated fat. Coconut oil is an excellent cooking oil and great for frying and roasting at high temperatures. Coconut oil is used in many Paleo dessert recipes, and some even find it tasty to eat coconut oil straight from the spoon. 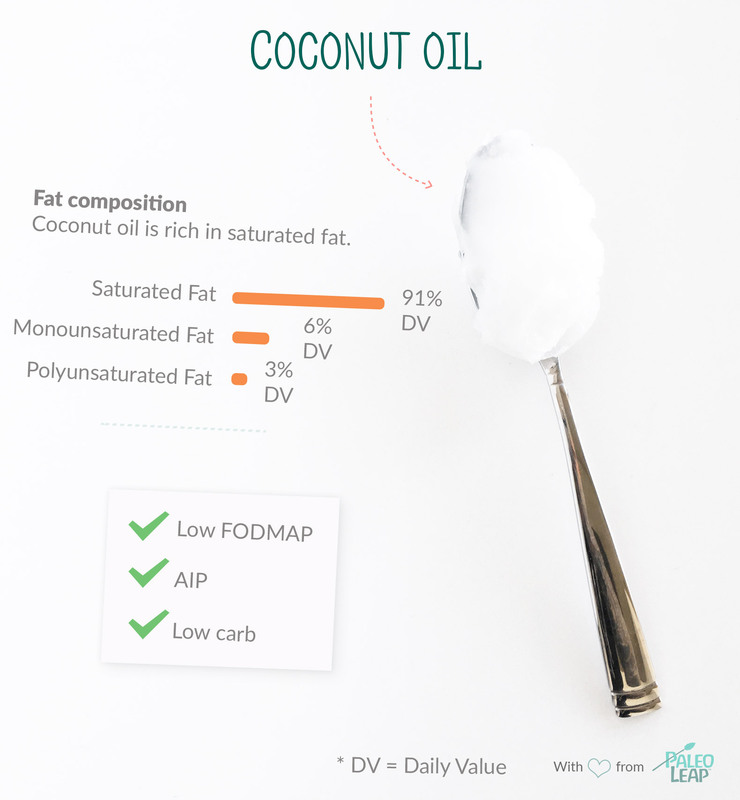 Paleo puts an emphasis on high-quality fats, and an unrefined (preferably organic) coconut oil is health promoting. Coconut oil contains roughly 91% saturated fat, 6% monounsaturated fat and 3% polyunsaturated fat. There’s a specific fat in coconut oil called medium-chain triglyceride (MCTs) that has become quite popular in the Paleo community, particularly in regard to adding it to coffee (AKA bulletproof coffee). MCTs are easy to digest and can be helpful for those with gallbladder issues, or those who have trouble digesting fats. MCTs are great for quick energy, because they do not need to be broken down to be used for energy, hence why bulletproof coffee has become so popular (caffeine + MCTs = loads of energy). Orange dots show how 1 tablespoon of coconut oil fits into the typical nutrient profile of a Paleo meal. REFINED VS. UNREFINED: Choose an “unrefined” coconut oil. This means the coconut oil has not been heated or treated with deodorizers or other chemicals. STORAGE: Coconut oil can be stored at room temperature and out of direct sunlight, like in a cupboard. If it’s hot, the coconut oil will turn into liquid; if it’s cold, it will turn more solid. OTHER USES: Coconut oil is often used in skin and hair care — for starters, try using it as a face or body moisturizer. Roasting, broiling or pan-frying at high heat? Coconut oil is heat stable and safe to cook at high temperatures. Need an energy boost or extra calories? Add a spoonful of coconut oil into your coffee and blend. Many Paleo dessert recipes call for the use of coconut oil. Smoothies are full of vegetables and fruit, but sometimes lack dietary fat. Add a spoonful of coconut oil and blend.